"Crime Does Not Pay!" Those four simple words sum up the basic philosophy behind "Calling All Cars", a popular crime drama heard over CBS Pacific Network stations from November 29, 1933 to September 8, 1939. In these dramatizations, the point was driven home time and time again that a life of a crime was a life wasted -- and anyone venturing off the straight-and-narrow was fated to meet a sad and sorry end. As obvious as this moral notion may sound, reality is that for some during the early years of the Great Depression, crime did pay -- and pay very well, too. One of the major results of a stock market plunge, bank failures, Midwestern crop disasters, and mass unemployment was the rise of the criminal as folk hero. Coming out of an era of prohibition, when the mob-controlled speakeasies were the average Joe's best hope for a soothing drink and some lighthearted entertainment after a hard day, the bank robbers of the early 1930s - John Dillinger, Bonnie Parker and Clyde Barrow, Charles Arthur "Pretty Boy" Floyd, and many others - were often seen as headline-grabbing Robin Hoods, robbing from the rich to give to...well, themselves mostly, but occasionally the poor, too. And with President Hoover coming across more as a do-nothing Prince John than a brave King Richard, quite a few common criminals were seen not as the ruthless, uneducated, gun-crazy yahoos they mostly were but, instead, as free-living scalawags who were overcoming the ravages of the depression in their own unique and individual way. Movie studios - particularly Warner Brothers, with their predilection for gritty newsreel-style docudramas - spent much of the early 1930s glorifying the world of the gangster and the hoodlum, often portraying them as high-living mugs with a taste for a better life. Yes, the Production Code (at least after 1934) required them to either die or get sent up the river at the end of the movie, but at least they went for the gusto when they were around. Cast in these parts were some of the most charismatic actors ever to grace the silver screen - people like hoofer-turned-screen hoodlum James Cagney in "The Public Enemy", classical actor Edward G. Robinson as "Little Caesar", and Yiddish Theater actor Paul Muni as the legendary "Scarface", based in part on the career of Al Capone. In the end, is was true that crime didn't really pay (all of these characters died in a hail of bullets in the last reel), but the luxury of taking what you wanted and enjoying it while you lived looked pretty good to audiences who were getting less and less and struggling more and more every day. It took the election of Franklin Roosevelt and the subsequent promotion of such equally charismatic men as Melvin Purvis, J. Edgar Hoover, and Elliott Ness to finally turn the tide against the criminal element. The rise of the heroic "G-Men" and their well-funded crime-fighting organizations finally began to defeat the seemingly heroic bank robbers and mob kingpins who had dominated the headlines since the 1920s. Careful investigations, often followed by bloody shootouts, turned lawmen into heroes and, eventually, the common man against the criminal element. Radio, too, played a part in stemming the tide against crime - and never more so than in "Calling All Cars", one of the earliest and most durable police procedural shows. Dramatizing true crime exploits, and introduced by real-life law enforcement officials, "Calling All Cars" offered listeners the gritty details of criminal activities in true "ripped from the headlines" style. Led by writer/director William N. Robson - later to become the well-respected director of such series as "Big Town", "The Man Behind the Gun", and "Escape" - "Cars" offered listeners the audio equivalent of a Warner Brothers crime drama, complete with driving musical themes, car chases, low-life gunmen, high-crime bosses, gum-chewing molls, frightened victims, and criminal cases that often hit close to home, particularly if you lived in Los Angeles where the series was produced. Kidnappings, petty thefts, prison breaks, bunco schemes...all were raw materials for the creators of each show and details of all these crimes and more were used as the basis for the realistic dramas being presented. The narrator of the program was Charles Frederick Lindsley, a speech professor and radio announcer whose precise diction and enunciation put the real-life professionals appearing on the show to shame; the only other regular heard each week was real-life L.A.P.D. dispatcher Jesse Rosenquist, whose unique voice and name became the show's trademark, contributing to the American lexicon both the program's title and the now time-honored phrase "that is all", ensuring his stay for the show's entire run. 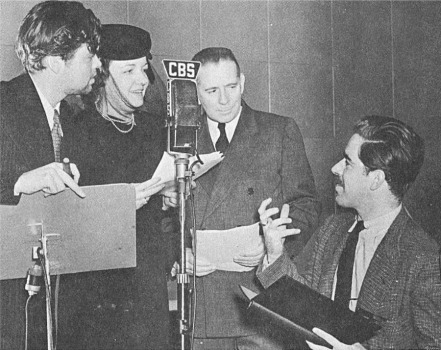 Like many radio programs of the period, none of the other actors on the series ever received on-air credit, but sharp-eared radio fans can hear the likes of Elvia Allman, Charles Bickford, Gale Gordon, John Gibson, Richard LeGrand and Hanley Stafford, to name just a few. Radio enthusiasts might also notice that "Calling All Cars" acted as sort of a blueprint for a later police procedural series that emphasized the painstaking work and day-to-day detail involved in tracking down the criminal element, that program being none other than the celebrated "Dragnet", which was brought to audiences by actor-producer Jack Webb in June 1949. "Cars" even has a jaunty opening theme reminiscent of Walter Schumann's "Dragnet March" - though a few have noticed that it also sounds remarkably like "The Bible Tells Me So" played slightly sideways. Although this nearly seventy year old series may sometimes sound a bit unsophisticated and primitive to modern-day audiences used to realistic television docudramas, it still makes for cracking good entertainment; broadcast historian Elizabeth McLeod, in an entry in Jim Cox's reference book "Radio Crime Fighters," states that "Calling All Cars" is "an excellent example of what a well-produced dramatic show was like in the mid-thirties. Early radio drama tends to get a bad rap from people who've only heard the really cheap syndicated serials of the 1930s, but given a decent budget and a good production team, I think thirties drama stands up quite favorably." The program's long-time sponsor was the Rio Grande Oil Company and, in fact, the show itself ran only in those areas where their patented brand of "cracked" gasoline and "Pennsylvania" lube was sold. To promote the series, in the mid-1930s, Rio Grande service stations offered a much-in-demand free premium: a monthly periodical entitled "Calling All Cars News," which spotlighted stories that would soon be aired on the program. But because the program was also sent via transcription to Southwestern markets served by Rio Grande but beyond the reach of CBS' West Coast stations, a whopping 299 of the 302 programs that were originally broadcast have more or less survived the ravages of time and are extant today - including these twenty half-hour episodes in this second collection, newly restored and remastered from the original transcription recordings by Radio Archives. Calling All Cars brings up many memories for people not only living in Southern California, but also Hollywood movie history of the time known to movie audiences around the World. The March 19, 1935 episode deals with the Mae West Jewel Robbery, and concerns an actual robbery in the life of Mae West. The actress playing the part of Mae West is excellent and imitated Mae West in other venues for many years. Such stories as this one with actual Police Officers used in the script, adds a definite interest to this very early Radio Show. The Radio Archives Staff have done an excellent job in restoring these CD's back to their original sound and tonal quality and well packaged for storage and protection of the CD's. HIGHLY RECOMMENDED. Just can't believe that this show is over 75 years old it sound so clear can't wait to get the next set. I just finished reading your liner notes about "Calling All Cars" and just had to tell you how good and interesting they are. Great reading, as many of your other liner notes are.